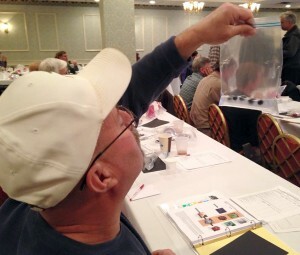 First catch Livingston County : Spotted Wing Drosophila Latest information from the NYS IPM Program. 3 SWD were caught in traps checked on July 6, 2017 — 2 female and 1 male were found in the trap set on the edge of the small blueberry planting at this location. Checking fruit for larva with salt flotation. These traps are being serviced by Jennifer Damon for Dave Thorp, extension educator, Livingston County Cornell Cooperative Extension. Nicole Mattoon, IPM field technician, and Taylere Herrmann, IPM summer technician, with the NYS IPM Program are identifying the insects caught in the traps.